Put this in every sweet recipe! Okay, I have said it before, so I won't hesitate to say it again, I LOVE almond. I love almonds, but even more so, I love almond extract. In honor of my beloved extract, I am writing an entire article of its possibilities. I love it in pound cakes and muffins; I'll take an almond poppyseed over a lemon poppyseed any day. The other great thing is that its so easy to substitute. Almost anywhere you have a vanilla extract based recipe, you can substitute it for almond. ( but be aware it's a strong flavor and you may not need to use quite as much). I've come up with a few places you can substitute, but feel free to experiment on whatever! 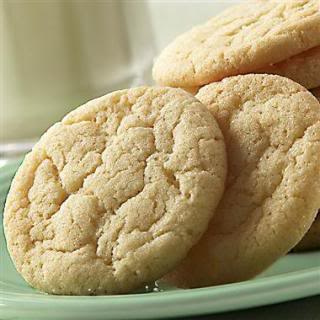 I've had almond sugar cookies before> HEAVEN. Then it's good on anything that a vanilla based one would be good on. And I used a picture of blueberry pancakes because I eat almond syrup with blueberry French toast and it's awesome. My mom makes a killer apricot almond jam. I could see a yummy raspberry almond jam, too. Worth a shot. Here's the thing, almonds (actual almonds) are also great and enhance recipes. Toasted almonds in a green salad are hard to beat. Not to mention all of the great protein you get with an almond. What a great snack! BTW, The flavor of almonds can substitute many nuts in many recipes. I've included an almond recipe for your benefit. Something I loved about this recipe (besides the fact I know it's good), is that the woman who submitted it to Taste of Home has a cool story with it. She was a single mother, and during Christmas time, her neighbor, who was Swedish, brought these bars. What a great way to spread good cheer and tidings! Thinking of someone else and taking them a treat. Many times when you serve someone, (like bringing a plate of goodies) you have no idea how much it lifts there spirits. There have been times I have felt low and having someone stop by just to say hi or see if I needed anything lifted me out of those blues. I think we're here on this earth to help each other out. Everyone wins when we help each other. Life is easier because people aren't left to their burdens alone, and you feel better because you helped. Full circle, True happiness money can't buy. You could change someone's life with a simple act of kindness (and your own). You can brighten someone's life. 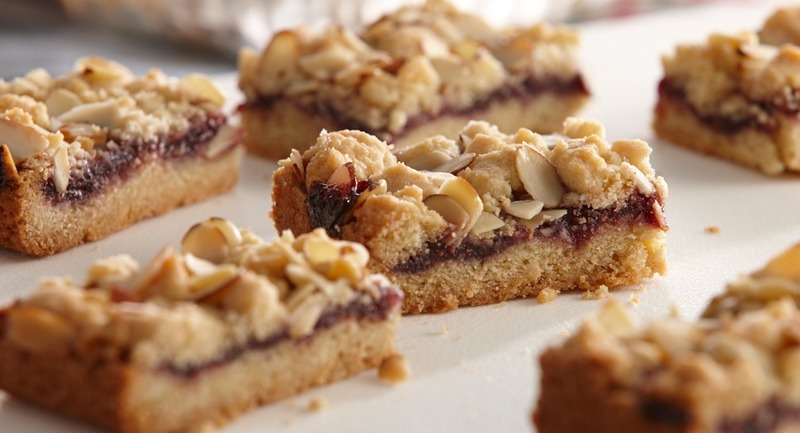 That woman has now made the almond bars every Christmas for 36 years (and I bet she's taken them to people on multiple occasions) I know its not Christmas but its never a bad time to spread good cheer! In fact, it's always a great time. Preheat oven to 350°. In a large bowl, cream butter and confectioners' sugar until light and fluffy. Gradually add flour and mix well. Press onto the bottom of a greased 13x9-in. baking pan. Bake 18-20 minutes or until lightly browned. Spread jam over crust. In a large bowl, beat egg whites until soft peaks form. Gradually beat in sugar, 1 tablespoon at a time, on high until stiff peaks form. Fold in coconut and 1/2 cup almonds. Spread over jam. Sprinkle with remaining almonds. Bake 18-22 minutes or until golden brown. Cool completely on a wire rack. Dust with confectioners' sugar. Yield: 2 dozen. Recipe formatted with the Cook'n Recipe Software from DVO Enterprises. This Vitamin-Rich, Highly Prized Spice Wears Many Hats! A French Apple Tart-EASY and Beautiful! Cast a Vote for Cast Iron! DELICIOUS Twist on an Easy Classic! How Professional Bakers Donít Get Fat at Christmas! How many people does it take to change a light bulb?